An extremely sensible look at the big picture of American foreign policy. Chase (International Studies/Johns Hopkins), Hill (International Security Studies/Yale), and Kennedy (History/Yale) assume that the primary focus of American foreign policy will always be the other great powers and smaller states with which we have a special relationship, such as Israel. They maintain that responding to the rest of the world on an ad hoc, crisis-by-crisis basis, however, is inadvisable even if traditional, and promote development of a coherent, positive foreign policy applicable to the third world. Their “pivotal states” approach assumes that “a select group of developing countries” have futures “poised at critical turning points,” and their fates could “significantly affect regional, and even international, stability.” By placing special emphasis on relations with these states—Algeria, Brazil, Egypt, India, Indonesia, Mexico, Pakistan, South Africa, and Turkey—they believe the US can move from a reactive to a proactive stance in pursuing American interests among developing nations. 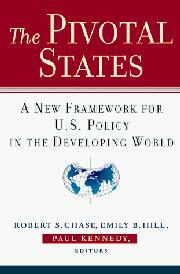 Individual chapters on each country are contributed by experts who adopt the pivotal states framework, assess each state in terms of its regional position and relations with the US, and make recommendations regarding future American policy. Another set of analysts contributes chapters highlighting cross-cutting issues—population, migration, environment, human rights, ethnic conflict, trade and finance, and strategic planning—which illustrate the potential advantages of a pivotal states strategy. The discussion is straightforward and dry throughout, as if leaving behind the ideological baggage of the Cold War has drained the passion out of international politics. There is an unspoken premise lurking here, however, and in the conclusion Chase, Hill, and Kennedy are willing to admit that they have unquestioningly embraced the traditional goal of promoting stability. This is a defensible position, of course, but one could hope that the end of the Cold War would facilitate more adventurous as well as less ideological and conventional thinking.